I love reading relationship advice on Reddit. Users on there ask some pretty interesting questions, and are very honest in their answers. In other words, they’re saying that all the FACTS are on their side! On paper, these guys are awesome. They did everything they were “supposed” to do. They’ve got everything going for them. How could anyone turn them down? When we apply for jobs, most of us obsess over our resume, cover letter or online portfolio. We think that if we just use the right words, if we just emphasize the right skills in the right way, THEN we’ll get noticed. We focus on the facts. We try to highlight our skills and positive qualities about ourselves. This is why so many of us end up not knowing WHERE we went wrong if we get rejected. We thought we did everything we were “supposed” to do. We had all the skills. We knew we could do a good job. Maybe we even hired a “resume writer” to format the whole thing perfectly. We had all the facts on our side. But if that’s the game you’re playing, you’ve already lost. What the hell does that even mean?! That’s the worst part of all — we pretty much NEVER get honest feedback! And what do we do afterwards? We put even MORE time into crafting our resume and cover letter or online portfolio, thinking that’s the “magic bullet”. The truth is, when you’re selling a product in a competitive market, you need MORE than just a list of nice features — you need to build trust. In his classic marketing book Breakthrough Advertising, Eugene Schwartz outlines a concept called market sophistication. The basic idea is that as markets become more and more competitive, companies’ marketing strategies need to become more and more sophisticated. Look at this old Apple ad, for example. The marketing here was not very sophisticated. 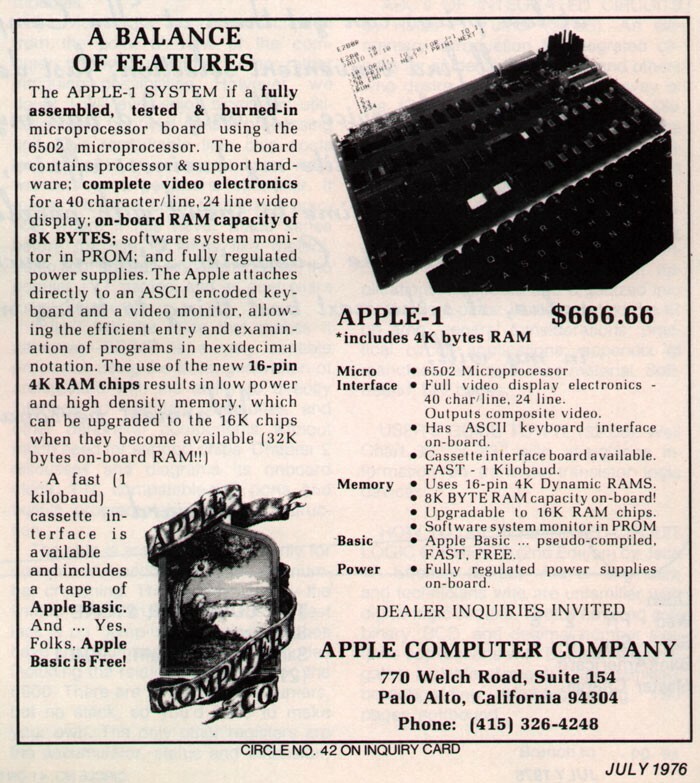 There weren’t a lot of computers being sold when Apple first launched. So all they needed to include in their marketing was a list of very basic features (like how much memory it has, etc). If a doctor is looking to get hired, his marketing doesn’t need to be very sophisticated either. All he really needs to say is “I know how to do the job and here are my credentials as proof” and he’s virtually guaranteed a job offer somewhere. The job market for doctors isn’t very competitive as a whole. But if you’re trying to get a job as say, a marketing coordinator, you’re going to have to play a different game. It’s not enough to say “I know how to execute XYZ marketing strategies.” or show that you’ve done a similar job before — everyone else says that too. It’s not enough to just apply online and nothing else — everyone else does that too. It’s not enough to walk into an interview and “answer questions” — everyone else does that too. It’s not enough to have the right skills — everyone else has them too. Think about it. If someone made a computer today and all they said was “it has 200 GB of memory”, would it sell? What if someone made a car and they said “well, it can get you from point A to point B safely”? OF COURSE it should be able to do those things. In a competitive market, every other product can too. Even though you buy a car to get from point A to point B safely, you’re not going be convinced if that’s all a car manufacturer said in their advertisements. As the job market becomes more and more competitive, it takes MORE than just having the right skills to be able to land an offer. Your marketing needs to become more sophisticated. You need to make the hiring managers feel comfortable about you on anemotional level to decommoditize yourself and stand out. If you all you do is send a resume, cover letter, and hope that you get called in for an interview where you’ll answer their questions, you’ve already lost the game. In reality, 80% of the work is done BEFORE you apply for the job. This is very different from how most people think. But the truth is, that’s when you make your impression. If you nail that 80%, your resume and everything else is practically a formality. That’s when you talk to employees at the company ahead of time, ask the right questions to find out exactly what their problems are, signal that you’re a top performer, and prove to them that you can solve their problems. This is how the best candidates can land interviews and top tier job offers without even sending a resume. Let me show you how they do it — in two simple steps. Most people fire off a thousand resumes, cover letters, and online portfolio links to a bunch of different companies, then cross their fingers and keep refreshing their inbox to see if they got an interview (which rarely happens). They mistakenly think that if they get specific about the type of companies they want to work at, they’ll “close doors”. You’ll take a different approach. First, go on some job boards and find a few companies that are hiring for the role that you’d like to have. Next, find someone at the company who’s working in the role you’re interested in, and reach out to them via email to chat. 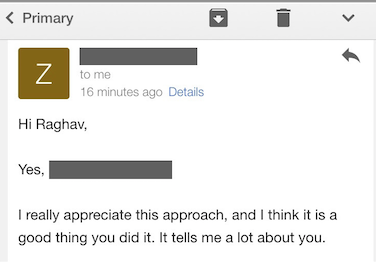 I’m Raghav, currently working as a [X] at [company]. In the past, I’ve mainly worked with early stage startups in design roles, but after some research, I think I may want to transition to a role at a larger company. I noticed on LinkedIn that you’re a [role] at Facebook. I’m considering applying for the [role] there, and I’d love to ask you some specific questions I have to see if it might be a fit. Would you be free for a 15 minute phone call sometime this Friday? If not, I’m also free this Thursday. I can be flexible if neither of those times work. PS. I understand you’re busy, so I’m happy to email you my questions if that’s more convenient. Thanks again! If you ask specific questions about the role and the culture, you’ll make a strong impression (because you’ll come across as a discerning candidate, rather than someone who will take any job they can get). Once you have your answers, move on to step 2. At this point, you know exactly what projects you’d be working on at the company on a day to day basis, and even some of the challenges they’re facing to get those projects done. So you can actually do sample of those projects ahead of time, and send them to your company contact to prove you can get the job done. When the hiring manager has a thousand resumes to go through, the way you stand out is not by writing a better resume, it’s by going beyond the resume and building trust by proving you can get the job done. I call this the “pre-interview project”. For example, when I was applying for a product design role at Quora, I knew that I would have to find ways to reduce the friction in the product’s user experience. So I did a usability test on the company’s mobile product, mocked up some design suggestions to reduce friction in UX, and sent it to their head of product design. And a couple of days later, he got back to me to set up an interview. 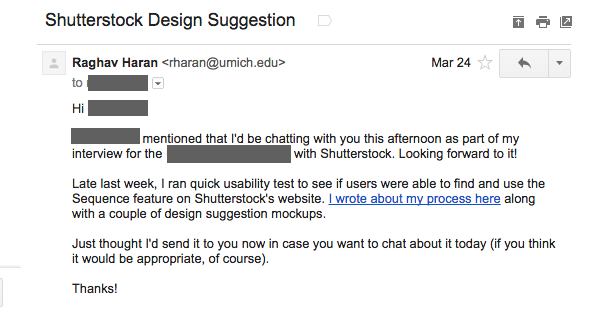 I did something similar for Shutterstock — I sent my pre-interview project to my interviewers before my interview. And they ended up creating a position for me in their product management team. This works best with roles where you can “recreate” the job on your own — for example, if you’re working in business development, you could sell some of the company’s product ahead of time and write about it. Or you could run usability tests on products and write about it if you’re going for a design role. Come up with a list of ideas that you could work on if you got the job. Noah Kagan, the founder of AppSumo, got a job as the director of marketing at Mint.com by doing something similar. He came up with a detailed 90-day plan of exactly what he’d do to grow the company if he were the director of marketing. He got the job. Write about how you did a similar job in the past. For example, if you’re a marketer, you could write up a detailed case study of how you grew a company X% before. Thanks again for chatting with me the other day about the [role] at [company]. After taking some time to think about it, I decided that this role would be a great fit for me. I thought it would be helpful for me to [insert a good description of your pre-interview project] to both show my interest and the value I could bring to [company]. I’ve applied online already, but please let me know if you know another way I could be considered. Thanks so much for your time! The reason this works so well is not only because you’re going out of your way to prove that you can solve their problems, but because you’re making an impression. Taking a proactive stand like this sends a message about you, and what kind of person you are. If you’re an ambitious person who wants to take your career to the next level, sign up here to get my 4 Step Checklist to Landing Your Dream Job — even if you’re not sure what you want to do yet. Even if you feel underqualified. Most of my content is counterintuitive, and different from the usual “career advice” you see on the internet.